Just got back from BABW and we got to meet Bearemy. Yay!!! And also got the messenger bags for both kids. Unfortunately they are one time use codes only so they are not universal. Sorry guys. 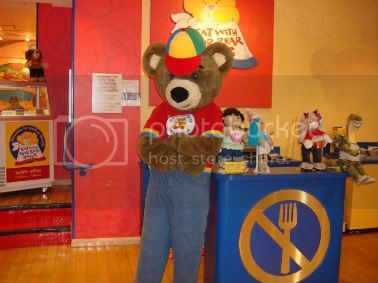 Here's a picture of Bearemy at the Eat With Your Bear Hands Cafe in NY. Last edited by AmandaBearLove; 08-16-2008 at 06:10 PM..
That's so cool on that you got to take a picture of him! I hope I can go tomorrow to meet him also! I saw him too. He was too cute! The look on the little kids faces when he walked out was precious! My dad was on BABV today and met someone who said she wore the Bearemy costume today. (She said it scared two little kids and made them cry... I remember my brother hid behind my mom when we went to see Pawlette one year.) I didn't even know Bearemy was coming to the store. That's cool!! that is so cool! does he give out a code for something like when Maxine came for a visit? No, Bearemy didn't give anything in person. When Maxine goes, it's usually for a grand opening and then you get a code for the Grand Opening Emoticon. Bearemy is giving so many things online already, he really didn't need to give more.